Many of us are battling depression, anxiety, mental illness, or personality disorders. We feel anxious, frustrated, and overwhelmed. We don't have the support systems to help lift us up and to help us cope with the stressors of daily life. We want to make things better for ourselves, but we may be at a loss as to how to do so. One of the first steps in fixing your life and your anxiety is to learn how to regulate your emotions. Our emotions cause us to feel out of control sometimes. Our emotional liability and the traumas in our histories are often to blame for many personality disorders and mental illnesses. They cause the increase in the stress hormone cortisol in our bodies, which then causes damage to our sensitive brains and our organs. Most of our parents haven't passed down emotional maturity. Emotional maturity is an extremely important thing for each person to work toward and strive for in our lives. It helps us feel whole and balanced. It helps us to make better decisions for ourselves. It helps us to feel that the world around us is safe instead of dangerous and caustic to us. Many members of the "normal" population were able to develop emotional maturity. However, many of us are missing this key element in our development. How do we find emotional maturity if we haven't developed it since childhood? 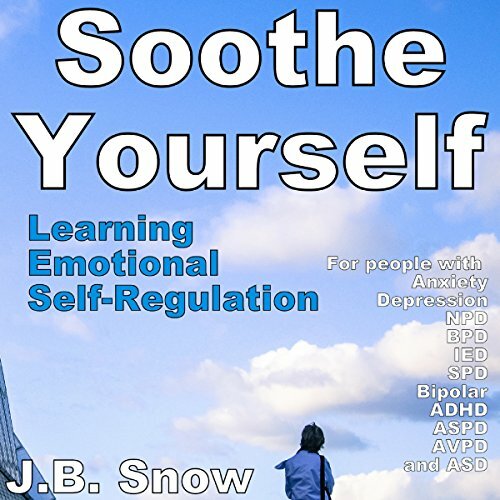 This book helps develop skills in emotional self-regulation. We can learn how to soothe ourselves. We can get in touch with the inner child that was wounded long ago, and seek to heal it.